Editor's Note: We're huge hot rod aficionados at Monterey Car Week. That said, we were compelled to run this historic 1932 Ford Lakes Roadster on Monterey Car Week. Thank you RM Auctions for permitting us to publish the article and the stunning studio photography. By the way, the roadster will be be crossing the RM Auctions block on May 2, 2015, as part of The Andrews Collection. Est. 225+ bhp, 286 cu. in. flathead V-8 engine with four Stromberg 81 carburetors, three-speed manual transmission, solid front axle with a semi-elliptical leaf spring, solid rear axle with a semi-elliptical leaf spring, and four-wheel hydraulic drum brakes. Wheelbase: 106 in. During his childhood, while growing up in Van Nuys, California, Jim Khougaz was fascinated with hot rods. After years of lustfully watching these machines rumble down the street en route to local races, Khougaz finally got his first taste of racing when he managed to tag along with a friend’s brother to Muroc in 1938. 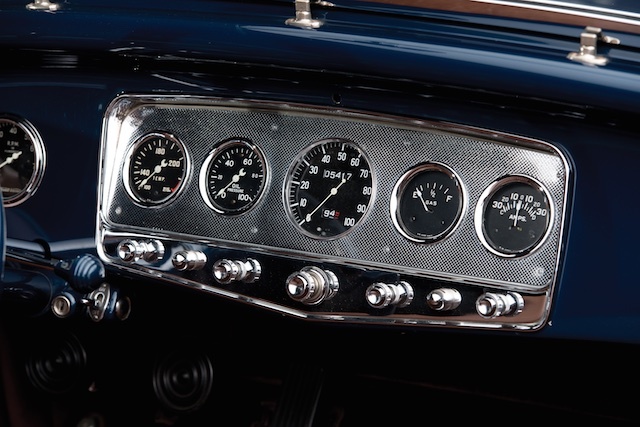 In high school, Khougaz purchased a basket-case ’32 Roadster for $50 and managed to get the car in running order to do some minor racing before duty called. After returning from serving overseas as a waist gunner in an Army Air Corps B-17 Flying Fortress, Khougaz decided it was time to dive into hot rods full time and compete with the best. 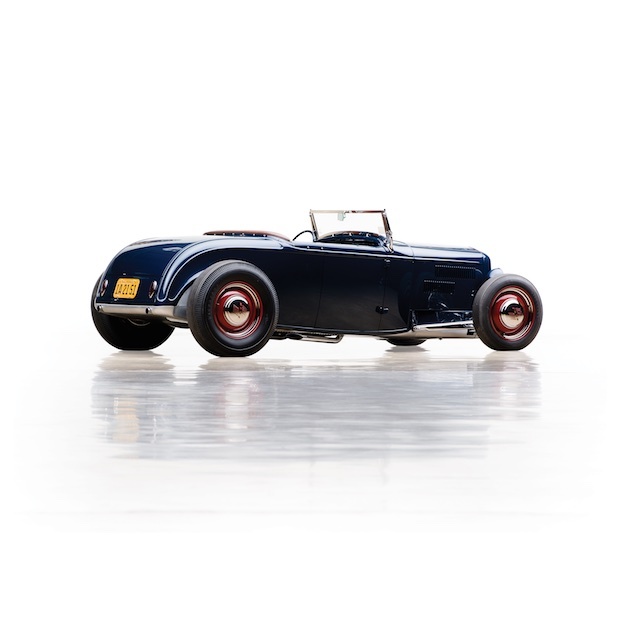 Starting with another ’32 Ford Roadster, Khougaz channeled the car a full seven inches over the frame and handcrafted a sectioned grille shell to match. The body was faired into the frame, and Khougaz fabricated a full-length aluminum belly pan. The hood was extended by two inches, with the hot engine enclosed between custom louvered side panels. With a flat spoiler affixed to the grille to keep the nose down at speed, and with the windshield removed (Khougaz used a chopped windshield from a ’32 Ford for street use), the Roadster cut through the air like a hot knife through butter. 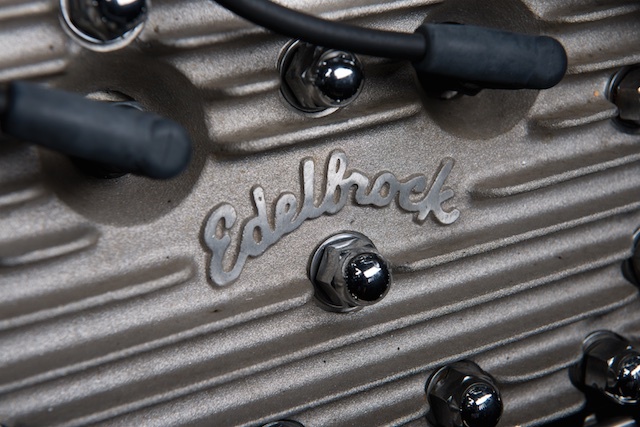 At the Roadster’s heart was a high-output 286-cubic inch flathead V-8 that had been modified with such features as a Winfield SU-AM cam, finned high-compression Edelbrock cylinder heads, and a quad-carb Edelbrock intake manifold. Furthermore, the car was fitted with twin Wilco magnetos, which were later replaced by a single Harman and Collins magneto. The engine block was ported and relieved, with all reciprocating parts carefully balanced, which was a specialty that would later help Jim to earn his living. He also built a custom column-shift setup for the three-speed manual transmission and fitted it to a ’48 Ford steering wheel. Interestingly enough, the Roadster doubled as Khougaz’s daily driver, but as the car became more successful and focused, it became his dedicated lakes racer. While racing on the lake beds, the car proved to be quite successful, becoming faster and faster with each successive run. In 1949, the car topped out at 141.95 miles at El Mirage Dry Lake. 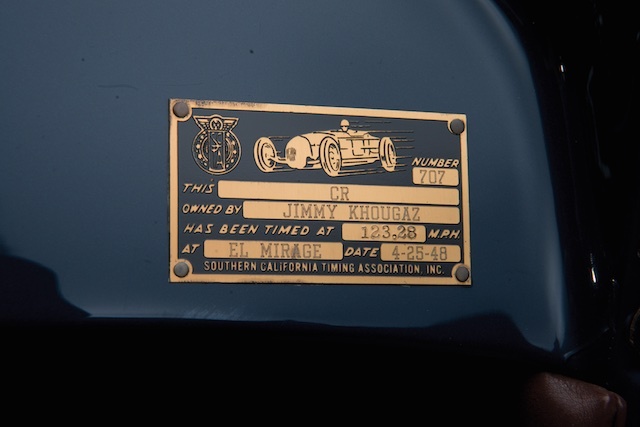 After winning a sizable collection of coveted Southern California Timing Association (SCTA) timing tags, Khougaz retired the car in the mid-1950s. As Khougaz’s engine-balancing business and other priorities took hold, his Roadster remained in storage in his loft for over 40 years. He finally sold the car to Dr. Mark Van Buskirk, an Indiana-based dentist, who subsequently shipped it to Dave Simard’s East Coast Custom in Leominister, Massachusetts, for a full, body-off restoration. Thankfully, when the Roadster emerged from storage it was largely complete and unscathed, allowing Simard to save a sizable amount of the car’s original sheet metal. A new belly pan was fabricated, and original or NOS parts were used in the restoration whenever possible. 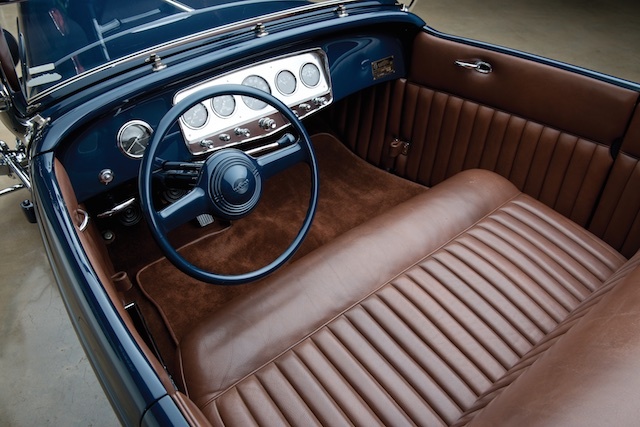 Steve Pierce, of Gilford, New Hampshire, matched the original interior with pleated cordovan leather and fabricated an authentic tonneau cover, while Viking Auto matched the paint to a sample found on the car. 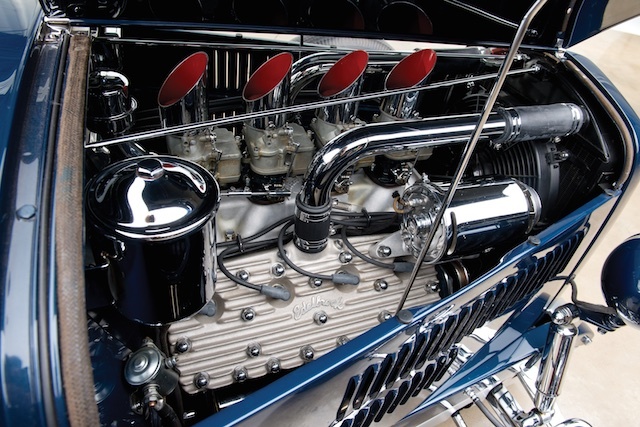 The 286-cubic inch flathead was built by Mark Kirby, of Motor City Flathead. During this process, Kirby used all the correct parts, including four carefully rebuilt and tuned Stromberg 81 carburetors. 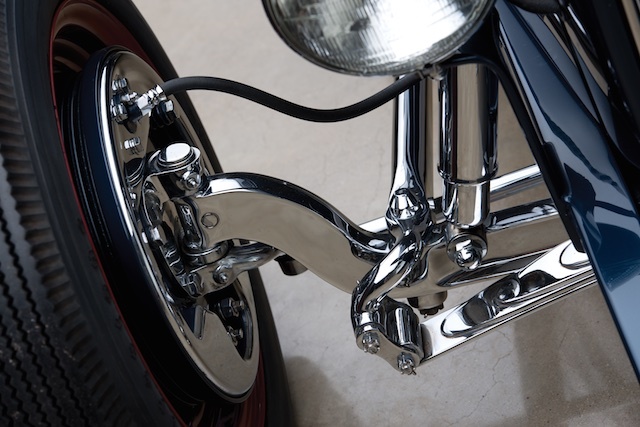 The engine is equipped with a set of chromed lakes pipes that can be uncapped, or the exhaust can be routed underneath the car through a pair of Smithy’s mufflers. 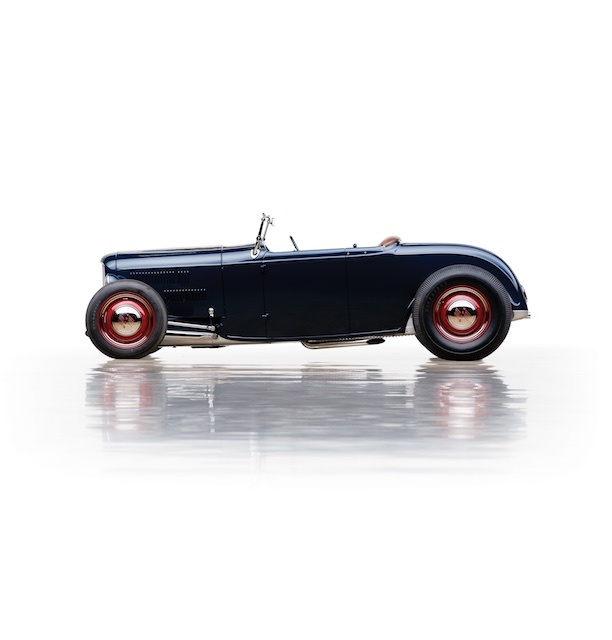 When the restoration was complete, the Khougaz Lakes Roadster made its grand debut at the 2001 National Roadster Show, where it won the Bruce Meyer Preservation Award. After its painstaking restoration and a few concours events, the Khougaz Roadster hit the road, just as its builder would have intended. Dr. Van Buskirk drove the Ford on the Colorado Grand and California Mille, and he even lapped Laguna Seca at the Monterey Historics. It travelled to Hershey, Pennsylvania, in 2004 and earned a First Junior award. It was also certified by the AACA as an authentic race car before racking up numerous trophies from such events as the Eyes on Classic Design and Rodeo Drive Concours d’Elegance. 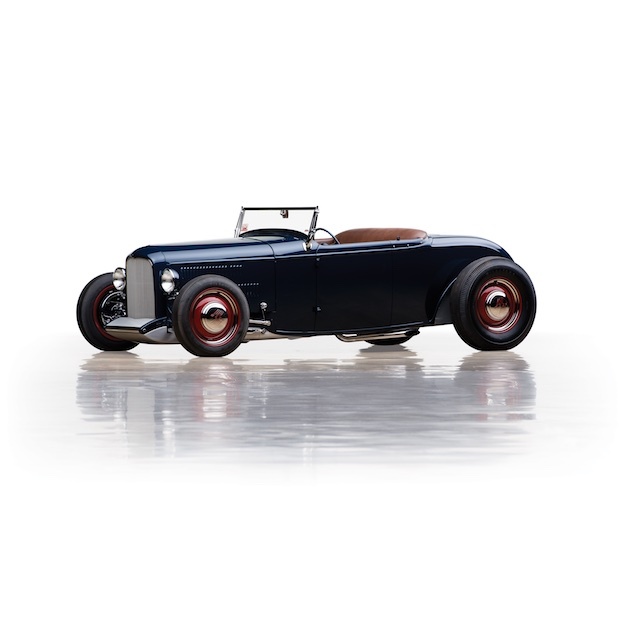 Additionally, the Roadster has graced numerous publications, such as Rodder’s Journal, Street Rodder Magazine, Rod & Custom, Old Cars Weekly, and Hop Up. 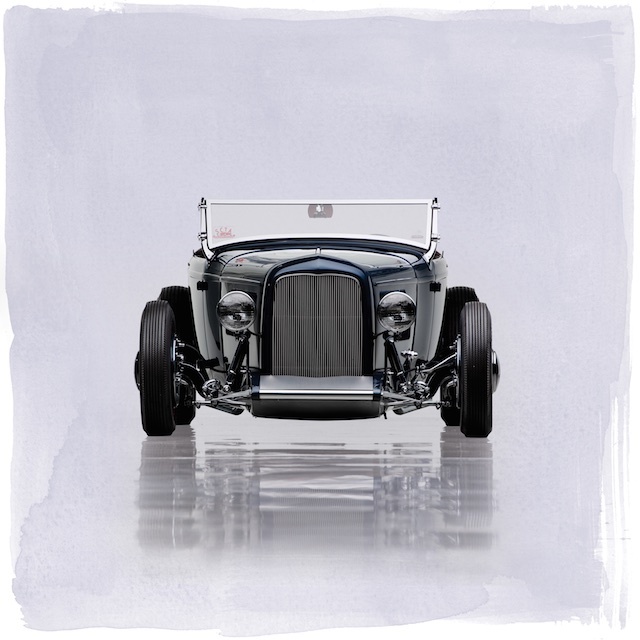 The 1932 Ford Roadster will always play a pivotal role in American automotive history for its place in hot rod culture, and few cars played a more active role in hot rod history than the Khougaz 1932 Ford Lakes Roadster. Its design, a masterpiece of automotive artwork and ingenuity, transcends generations, and it remains as timeless today as it was in the hands of its builder in 1949. Paul and Chris Andrews have had the distinct privilege of preserving this Khougaz Roadster for the past five years, and they are finally ready to pass it along to its next caretaker. The winning bidder of this lot will not only purchase one awesome roadster but also a hot rod legend that is ready for anything. 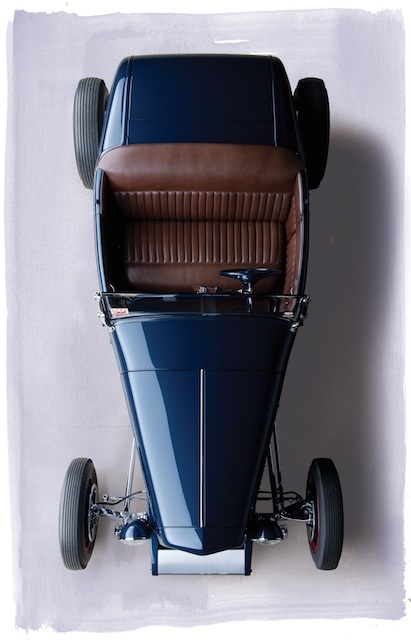 Make no mistake: this ’32 Roadster is of monumental importance.